Just before the sun began to set Thanh and Judy gathered with their family and friends for the wedding of their dreams. There in the Walt Disney World Wedding Pavilion in Orlando, Florida, they took their vows, exchanged wedding rings, and became husband and wife. Lisa From Disney Fairytale Weddings made sure that every detail, no matter how small, was taken care of. 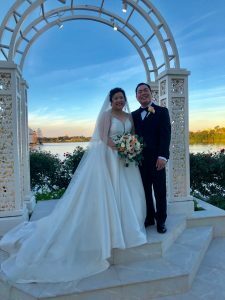 The Disney Florist created a beautiful bouquet of white garden roses, apricot roses, and seeded eucalyptus for Judy and boutonniere for Thanh. Rev.Glynn Ferguson with Sensational Ceremonies worked with Judy and Thanh to create a one-of-a-kind custom ceremony for the two of them. The ceremony was fill with laughter and tears of joy as they recited the vows they had chosen for one another. They even took Rev.Glynn up on his homework assignment (to write and say why they love each other.) They wrote: We are sorry about the delay of writing to you this letter about how we fell in love with each other so, where do we begin with the story of “Us”? Let’s start at the very beginning, a very good place to start. It actually started kind of like the movie “You’ve Got Mail.” Some people go online to meet people to date and some for people to hang out with. We simply just chatted and exchanged the occasional “how’s your day going”. It made sense since we lived in two different states, nothing more and nothing less. Sometime down the road though, we ran into each other by chance. That split second decision of “do I help this pathetic girl with her leaky car?” became “she’s got pretty rotten luck with cars, so she’s going to need a personal car fixer for life.” We’re on year eighteen now and it’s been full of ups, downs and lots of emotions. But nevertheless, it has been worth every second of that roller coaster ride. It’s taken a lot of courage, listening, learning, compromising to have gone from two people with completely different backgrounds to two who compliments one another nicely! It definitely helps when she’s always right! We are Lilo and Stich. Though brought up in completely different worlds, we share all the same core values. We are both extremely family oriented. As Stitch says, “Ohana means family. Family means no one gets left behind… or forgotten!” So reality is, it’s not just two people getting married, it’s really two families coming together as one. We are Jasmine and Aladdin. We are Pooh and Piglet. We are the best of friends and have nothing but care, respect and encouragement for each other as well as everyone else around us. “If you live to be 100, I want to live to 100 minus one day so I never have to live without you!” is exactly how we feel about each other. We are Carl and Ellie. We wanna grow old together! We always tell each other that our hearts are always right and follow them together no matter what others tells us. And our hearts tell us we want to hold hands until the very end. So here we are today 18 years later and getting married. JW Jaeger got the night off right and kept everyone on the dance floor. He even assisted the groom as he dance the Gangnam Style.